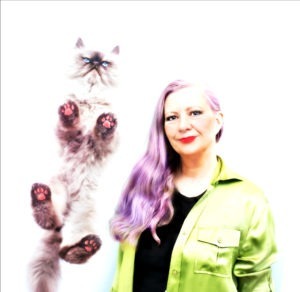 They are based in the U.K.and offer a global perspective to cat care. Their approach is aligned with our philosophy at Cat Wisdom 101 and their archive of resources is invaluable. As the age span of cats has increased, with many cats living well into their 20s, a revised chart was needed. As my old cat Merlin aged, I never knew if he was 90 something or a hundred in human years. As new behavior research continues we have a deeper understanding of feline behavior and the new chart reflects it. There are three new life stages. JUNIOR, PRIME and MATURE. Kittenhood expands into in junior. Until recently kittens were considered adults at age one but that isn’t accurate. Many breeds don’t reach maturity physically or behaviorally until age two or three. Instead of labeling cats as adults, they are labeled true adults in their prime from ages three to six. It makes sense to those of us with young cats. Our Odin is shifting gears at age six to what feels more mature. The biggest new shift is removing the SENIOR label currently about age 7 to MATURE and pushing off SENIOR to age 11. This will be an excellent boost for adopting older shelter cats. GERIATRIC which is currently from about age 12 is pushed to age 15 and that will be welcome news with those with older cats. Again, a positive reframing of older shelter cats to more adoptable. All cats regardless of age, need to a veterinarian annually. For mature cats who are middle-aged in human years may need for frequent vet visits. The chart ends at age 25 and in human years at an astounding 116. Perhaps in time, it could be stretched another year or two and the age equivalents tinkered with from age 20 on. As it stands, I feel it’s a huge improvement over any other chart available. 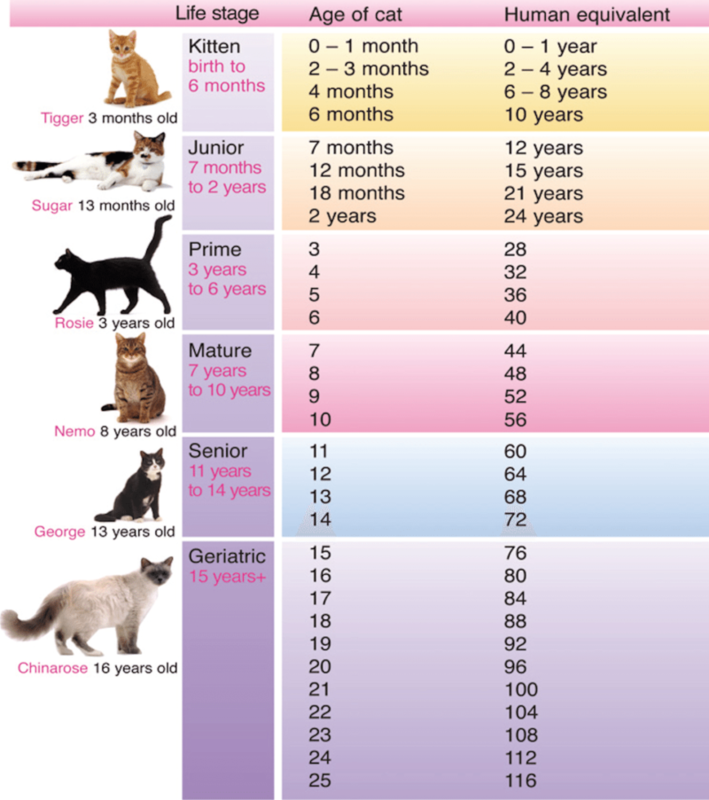 I’d love to hear your thoughts about the Cats Age in Human Years Chart. Are your cats younger or older than you thought? As with people, are we not as old as we feel or act?? MOL! Pipo and Minko are both 12, and they can really be kittens sometimes, and be as silly as when they were. I didn’t know cats are that old while they still look and act like kitties. I have 2 of them, 12 and 36 year old. How interesting to know my baby is older than me. That’s a great way to have a perspective about aging as you both get older and the need for regular medical/vet wellness visits. What I’d like to see addressed on this chart is something I’ve seen on other cat aging charts: the difference in aging between indoor and outdoor cats. This chart seems to reflect the aging we find in healthy, indoor cats but I believe (from other research I’ve seen) that outdoor cats tend to have shorter lifespans and age a bit more quickly. Is it possible to make this a two-column chart that shows comparative aging? I certainly don’t want to get in the way of having shelter cats adopted or labeled “older” than they really are, but I think it’s important for people to realize that the hazards of an outdoor life can shorten a cat’s lifespan somewhat. Just a thought! That’s an interesting idea. The chart does not take into account how healthy a cat is. The age span of outdoor cats has greatly increased and that includes feral cats. All cats are living longer. That’s good to know about your cat’s longevity and that you’re open to adopting older cats. It’s what we usually do and we love older cats. I wonder if there is a new dog version? Looks like we’re all mature and senior kitties. It’s very young but not unusual in certain cultures for girls to get married at that age. Debby: Thank you for posting this chart! I had no idea Lilith, at age sixteen years, was so old in human years. Lilith: Mrrrp? I may be an old lady cat, but I feel like a kitten! Glad to help. When we think of age in human term, it’s all the more reason to bring our pets to vet more frequently. that’s great news. Keep observing for any changes. You know cats love to hide symptoms. Sometimes age doesn’t matter, Sunday I opened my backdoor to a grey cat with huge green eyes, I was in love, he talked to me as to say, what took you so long! I brought him in and put him in my spare bedroom, he was in perfect condition, I figured he was maybe 6 or 7. The next morning, my neighbor lady came asking if I saw a grey cat, since I have cats, she thought I would know where he was! Turns out Smokey is 12!! It was a heartwarming family reunion. Humans aren’t considered senior until 65 so maybe they should redefine that so cats aren’t senior until 65. I’m 12 and still kittenish is many ways. I’ve lost a step but am more mature than senior. Also, 64? Seriously? Still this chart is an improvement on the last one. CK, interesting point but what about other countries? In the U.K. seniors are 65 for men and 60 for women. Phoebe isn’t going to like being called geriatric when she turns 15 in July. Ha, but she’s been one according to our U.S. system for three years. Sending purrs to dear Phoebe. My human agrees with pushing off the geriatric and senior parts of the chart, judging from her experiences with Binga and Boodie. They are just now coming into the geriatric stage in her assessment.